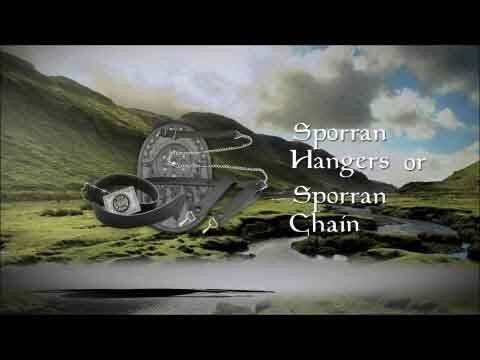 This sporran is made in Scotland and offers great value for the money. It's not a stiff leather like most sporrans... it's supple, yet tough. The top flap features a pewter Celtic knotwork medallion and each one comes with a sporran chain. 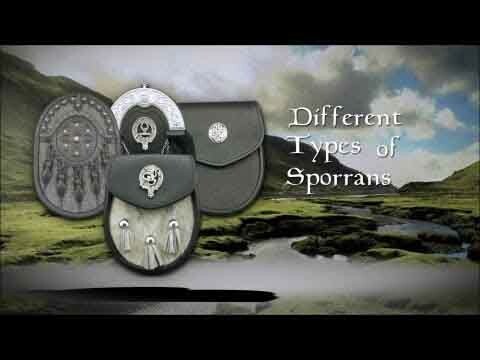 If you want a great entry level day sporran, this is a safe bet! Received this sporran with a number of defects. 1. Not please with the final stitching. A few areas (six total) are not trimmed properly, where excess stitching (half-inch strands) still need to be cleaned up. 2. The final edge trimming was hap-haphazardly completed, enough so, that the stitching stops approximately one-quarter inch from the end of the edge trimming in essence, leaving a small flap. 3. The leather on the back of the sporran has been stamped with lettering, but the stamping was done so lite you cannot read what it says. It's visible and illegible. What is the point of stamping it? 4. Finally, there is a small, hard, round object protruding from under the front layer of leather - it is sandwiched between the two pieces of leather that make up the sporran. The best way to describe it is, it looks like an ugly all-black face pimple that you cannot get rid of, about one-quarter inch diameter. I really do want to like this sporran, but I feel no care has gone into the manufacturing process - it's very sloppy at best. Not knowing when this was manufactured - hopefully they have identified discrepancies in-house and rectified the issues. $60 USD (at the time of my purchase) is a lot of money, but I do not feel the value is there.